In the early 20th century, the population of New York City’s Lower East Side swelled with vast numbers of eastern European Jewish immigrants. The tenements, whose inhabitants faced poverty and frequent unemployment, provoked the hostile attention of immigration restrictionists, many of whom disdained Jews, racial minorities, and foreigners as inferior. Accordingly, they aimed to stifle the growth of dense ethnic settlements by curtailing immigration. Dispersing the Ghetto is the first book to describe in detail an important but little-known chapter in American immigration history, that of the Industrial Removal Office (IRO), founded in 1901. Established American Jews—arrivals from the German states only a generation before—felt vulnerable. They feared their security was at risk owing to the rising tide of Russian Jews on the east coast. German American Jews believed they too might become the objects of anti-Semitic scorn, which would be disastrous for German and Russian Jews alike if it were allowed to shape public policy. As a defensive measure to undercut the immigration restrictionist movement, American Jews of German origin established the Industrial Removal Office to promote the relocation of the immigrants to the towns and cities of the nation’s interior. Until the onset of World War I, the IRO directed the resettlement of Jewish immigrants from New York and other port cities to hundreds of communities nationwide. Drawing on a variety of sources, including the IRO archive, first-person accounts of resettlement, local records, and the Jewish press, Glazier recounts the operation of the IRO and the complex relationship between two sets of Jewish immigrants. Jack Glazier is Professor and Chairman of the Department of Anthropology at Oberlin College. He is on the advisory board of the Encyclopedia of Diasporas. Jack has collaborated with the anthropologist Arthur L. Helweg on the inaugural volume, Ethnicity in Michigan, of the series, Discovering the Peoples of Michigan. He has also served on the Board of Directors and the Program Committee of the American Anthropological Association. He is a Fellow of the American Anthropological Association and the Royal Anthropological Institute. 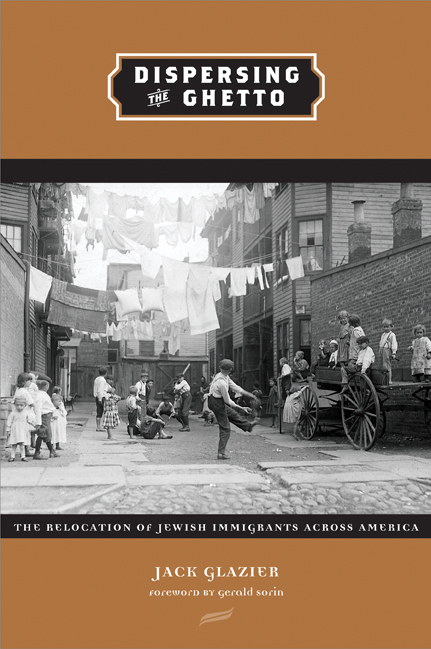 Jack has also published Dispersing the Ghetto: The Relocation of Jewish Immigrants Across America, with Cornell University Press.